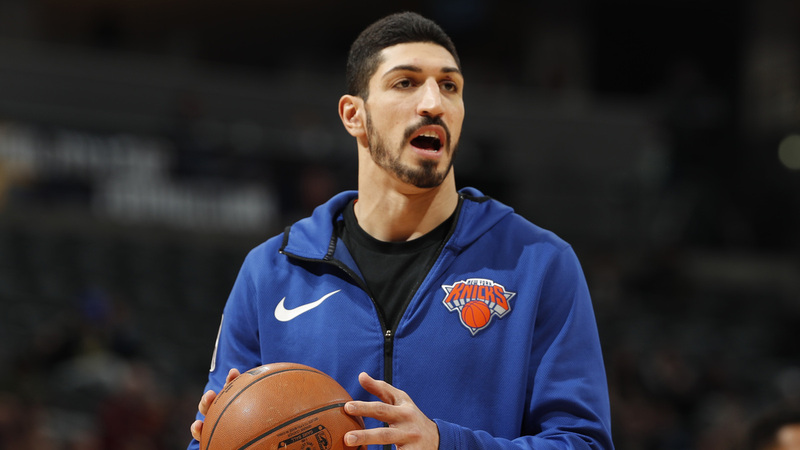 A Critic Of Turkey, The Knicks' Enes Kanter Speaks Out About His Fears For His Life The NBA star says he fears that if he travels to London for an upcoming game against the Washington Wizards, he might be killed for speaking out against Turkey's president. New York Knicks center Enes Kanter has been a vocal critic of Turkish President Recep Tayyip Erodgan. Last time the New York Knicks played the Washington Wizards, Enes Kanter scored 18 points. For their next game, he won't be there to score any. Kanter recently announced he won't be joining the Knicks on Jan. 17 when they'll play the Wizards in London as part of the NBA's Global Games series because he fears for his safety. Kanter is from Turkey and has been an avid critic of Turkish President Recep Tayyip Erdogan. He says if he travels to London, he fears agents of the Turkish government might kill him. "The Turkish government is very famous for hunting down those who oppose Erdogan ... I just didn't really want to risk my life by going to Europe where Erdogan's long arms are everywhere," he said in an interview with NPR's Scott Simon. Kanter said that in the past few days, he has gotten "hundreds of death threats." He said if he did travel to London, he would only be able to go to practice, the game and his hotel, with security around him 24/7. In 2017, Kanter was detained in Romania after Turkey revoked his passport, but was quickly released. Turkish prosecutors wanted him extradited to Turkey on charges brought after he tweeted statements critical of Erdogan in 2016. Prosecutors also accused him of being part of a terror group due to his support for the Gulen movement, a social movement led by cleric Fethullah Gulen, who Erdogan has blamed for a failed coup against him in 2016. Turkey has sought Gulen's extradition from the U.S., where he now lives. Kanter said his father was also indicted in Turkey last year and accused of being part of a terrorist organization. He was in jail for seven days before being released after mounting pressure from Kanter and his supporters in the U.S. Kanter said he currently does not speak to his family for fear they will be arrested. Former Turkish NBA player Hedo Turkoglu, a senior advisor to Erdogan who Kanter said he was once friends with, tweeted that the Knicks center can no longer travel to many countries due to visa issues. He called Kanter's remarks part of a "political smear campaign Kanter has been conducting against Turkey." "He is trying to get the limelight with irrational justifications and political remarks," Turkoglu said in a tweet. However, Kanter responded by tweeting an alleged travel document to show he can travel to London if he wants. "I love my country and I hope when all of the things are done, I want to go back to my country to see my family. But about Erdogan, he is an authoritarian leader who jails journalists and opposition," Kanter said. Since the failed coup, authorities have arrested and detained thousands of individuals on charges of supporting the coup. Human Rights Watch has described the government's crackdown as "symptomatic of the government's increasing authoritarianism." "I'm an NBA player and I have a big platform so I'm trying to use this platform to be the voice of all the innocent people who don't have a voice ... my family is still back in there and they are getting lots of threats too but I have to do this for all those innocent people," Kanter said.